Most price forecasts aren’t worth more than an umbrella in a hurricane. There are so many factors, so many ever-changing variables and dynamics, that even the most educated guess almost always ends up wrong. Further, some forecasts base their predictions on one issue. “Interest rates will rise so gold will fall.” That’s not even an accurate statement, let alone a sensible prediction (it’s the real rate that affects gold prices—the rate minus inflation). So instead, my gold price forecast for 2018 will look at the primary factors that impact the gold market to determine if each is likely to push the price higher or lower this year. I’ll conclude with the probable prices I see based on those factors, as well as some long-term projections, although what follows is merely a scratch on the surface of this topic. To learn more about investing in gold and silver and what factors drive the market, we suggest you read Mike Maloney's best-selling book, Guide to Investing in Gold & Silver. This will be fun, so let’s jump in. The US dollar fell 10.5% last year, a significant decline for a currency and its biggest drop since 2003. The factors that weighed on the dollar last year are expected to exert similar pressure again this year. The biggest factor is perhaps the Trump administration blatantly stating it wants a weak dollar, primarily to support US trade. Demand for coins and bars was near an all-time low last year. But the last time that happened it preceded a fury for demand for metal, with the complacency peaking just before the 2008 financial crisis. With bullion sales at multi-year lows, it is much more likely demand rises this year than falls. 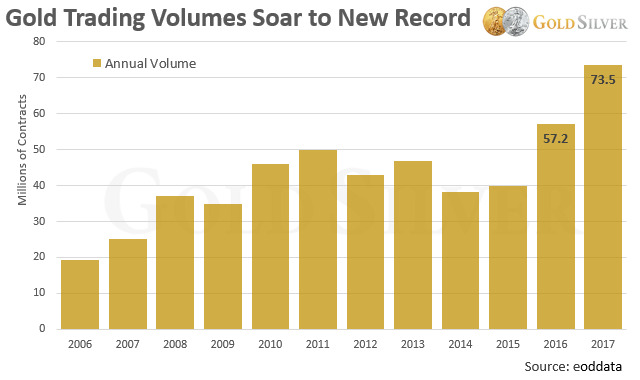 Gold-backed ETF holdings are now at their highest level since 2013. Check out the increase in holdings from the top 10 gold ETFs in the world last year. 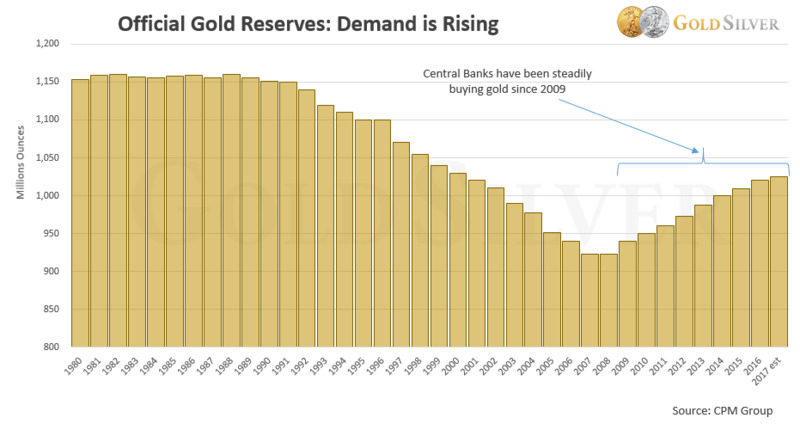 Global central banks have been buying gold at an accelerated pace for the past 10 years. Based on their recent activity, there is no reason to believe they will stop. Their continued accumulation is a source of support for the gold price. There has been a tug of war between these entities, though you can see open interest is generally higher now than it was three years ago, which corresponds to the rising price during that time period. This data usually isn’t predictive except at extreme readings. 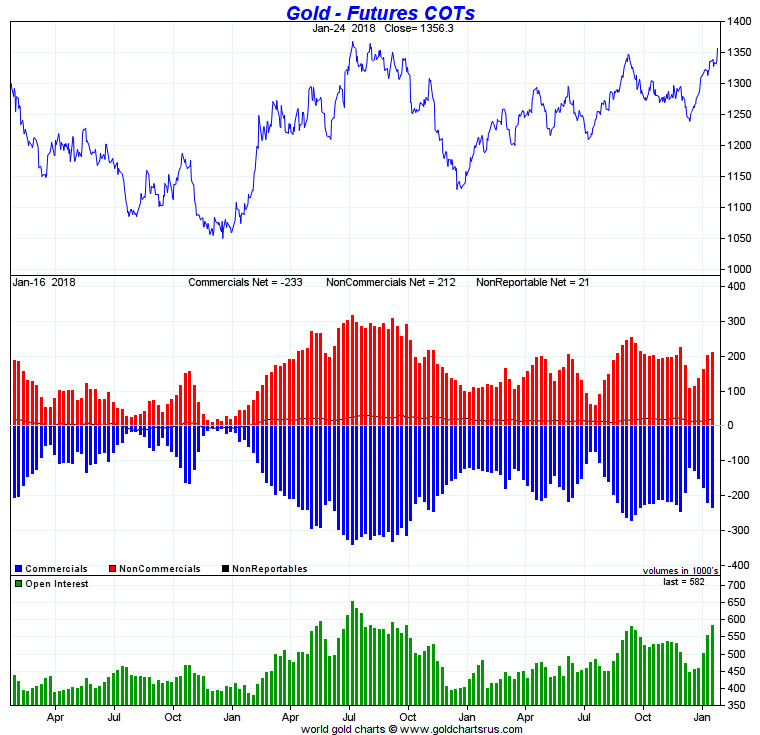 As of January 24, this factor provides no clear indication of what gold will do this year. While most mainstream investors are ignoring gold, the technical picture shows the price is coiling, which implies a big move is on the way. Our friend Dominick Graziano has amassed a seven-figure brokerage account from his technical trading. 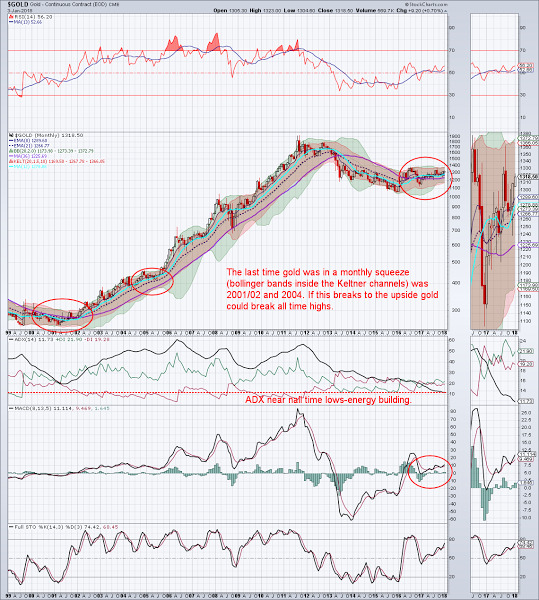 His recent monthly chart is eye-opening, and note his comments. The trading range of the gold price continues to squeeze tighter and tighter on a monthly basis, a technical sign that implies a breakout is coming. 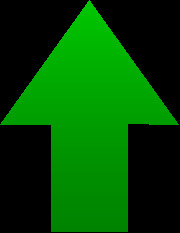 The technical picture doesn’t tell us when this breakout will occur, but as he says a new all-time high could be in the cards if gold breaks to the upside. Almost all mining analysts, including yours truly, have been sounding the alarm about the impending reversal in new gold supply from mine production. Some reports say it will peak this year, some say next year, a couple say it already has. But regardless of the timing, the reality is that new mine supply is about to reverse and begin a long-term decline. And the biggest portion of coin and bar sales each year come from new mine supply. All of the above reasons are fine and good, but one of the primary reasons we’re overweight gold and silver at this point in history is because of the numerous elevated risks that are present. Mike discussed his Top 10 Reasons I Buy Gold and Silver, which all point to a period that he believes will, sooner or later, propel gold higher. It is this big-picture backdrop for gold that tells us why investors should hold physical bullion at this time and why the price will ultimately end up much higher than it is now. Asset Bubbles: The bull market in stocks may or may not continue in 2018, but no trend lasts forever. And given how far the stock market has come, it’s only prudent to be wary of its bubbly valuation. If investors are caught off guard, the fall in financial markets could be bigger than average and quickly push investors into gold. And since gold is inversely correlated to most major asset classes, it is more likely to rise when stock markets crash. 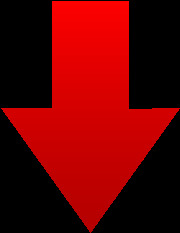 Inflation: Off the radar to the average Joe is the possibility that inflation kicks in this year. Check out what’s been reported in the past 30 days. You can see that in my view most of the factors that impact gold are expected to push the price higher this year. The message from this analysis is that even if gold rises only modestly this year, it has rarely been more important to own. The strategy is clear: 2018 is likely to be the last year to buy gold and silver at current levels, so dips in price should be bought.